When you obtain treatment here, you will receive a pain management program customized precisely to your unique circumstances. 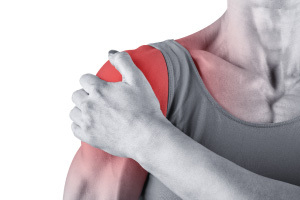 MPPC is a one stop treatment for all kinds of pain. We do Physical therapy, Pain medications and Interventional pain management procures all in one place. All pain procedures are done with C arm (fluoroscopy) at the clinic. You don’t have to go anywhere for most of your pain problems. 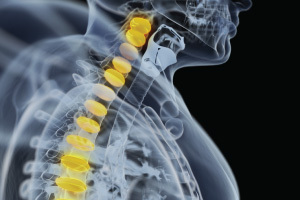 In most cases, spine surgery is intended to remediate pain by fixing its source. But spine surgery is risky, can cause new pain, is inappropriate for 90% of patients or may fail to provide any relief. Pain killers, for their part, merely mask the pain, can cause health problems and too often provide no relief. Our minimally invasive treatments can usually fix the problem or effectively interrupt the pain cycle, providing proven treatment alternatives… and the hope these patients need. We take all kinds of private insurances, and Medicare. Sorry we don’t take Medicaid. In addition we take all kinds of accident and workman’s compensation cases. Dr. Ranjit Wahi and his associates address and design pain management programs for patients individually in the Chicago area. Dr. Ranjit Wahi is affiliated with Holy Cross and South Shore Hospitals on the south side of Chicago. His professional, empathetic and skilled diagnoses and treatments have helped hundreds of hurting people in the Chicago area. Pain and injuries resulting from car accidents, workers compensation and other accidents are capably handled, including the claim paperwork. To accommodate all of our patients, English and Spanish are spoken at the Midwest Physicians Pain Center. Dr Wahi is an anesthesiologist who got his training at Cook County Hospital, Chicago. IL and have 20 years of experience in the pain management. At MPPC, we offer true alternatives for spine-related pain and non spine related. That ’s because our pain-relief specialist, Dr. Wahi M.D., Ph.D., is an anesthesiologist with advanced training in the management of pain. 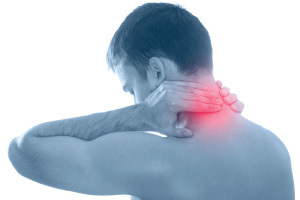 More specifically, he is skilled and experienced with today’s complete range of minimally invasive and non invasive techniques to relieve spine-related and non spine related pain. A COMPLETE RANGE OF EFFECTIVE NONSURGICAL SOLUTIONS. An advanced medical procedure used to reduce swelling and pain in and around the neck and lower back areas. Most individuals report less pain and increased mobility over days, weeks or months. This procedure lessens pain due to inflammation, damage and nerve impingement to small joints in the back and neck. Patients who experience muscle spasms or have their backs suddenly go out may benefit from this treatment. This decreases neural pain resulting from injury, dysfunction or illness. Patients with shingles, sympathetic reflex dystrophy and complex regional pain syndrome may be good candidates for this procedure. Using a device that transmits electrical impulses directly onto spinal nerves, this process helps heal back, arm and leg pain. This could assist people with degenerative disc disease or nerve root syndrome. Injecting a local anesthetic into fibrous trigger-point tissue in spastic muscles inactivates the trigger point and alleviates pain. Sustained relief is usually achieved with a brief course of treatment. Injecting an anesthetic-and steroid solution into a specific nerve root also blocks pain and helps determine its source. Oral Medications and Physical Therapy are also used to treat pain. This pain center is one of the best I have seen. Ana and Debbie are wonderful persons to talk to. If you are sincere in controlling your pain, this is the place to be. Dr Wahi is compassionate and sincere in his approach to treat you with minimal medications. In November of 2002, I moved to Chicago, IL. I had 5 back surgeries and a neck surgery. Not having a treating physician, I was able to find Dr. Ranjit Wahi who has a clinic on 95th St. through word of mouth. I have had chronic back pain since my fall as an iron worker in 1995. I have multiple pins and screws in my lower back. I was in bad shape and was much in need for some way to control my pains . Through different treatments i.e. pain medications, physical therapy and injections, Dr. Wahi was finally able to find the right combination of pain meds and injections to relieve my pain to a bearable level. I have now been with Dr. Wahi for about 8 years. Dr. Wahi is amongst best I have seen in my life and I have been to many physicians. He is very knowledgeable about pain management and treatments. My pain level is now bearable with 75% to 80% relief. He has been a “godsend” in my life. I can’t thank him enough for the care he has given me amongst his tremendous knowledge of pain relief. In addition he has been the best human being. Dr. Ranjit Wahi has managed my pain since 1997. During that time I’ve found him to be not only competent but also compassionate towards his patents. Dr. Wahi exhibits exemplary professionalism coupled with the right amount of humor and friendliness that relaxes the most intense patient, settings and procedures. His office suite is well maintained and I’ve never experienced an overwhelming wait time to be seen. I recommend Dr. Wahi without reservation. It was late November 2002 and I have recently arrived to the Chicago area 2 months prior. Over the 2 month period I was experienced a terrible pain in my back and chest area. I turned to the yellow pages where I found an advertisement for Midwest Physician Pain Center. After making an appointment and a series of tests, I was found to have a pea size lump in my right chest and a herniated disk in my lower back. Having the tumor in my right breast biopsied it was found to be a malignant for breast cancer. In the next 2 months the tumor had enlarged to a golf ball size. Overnight, Dr. Wahi contacted a team of professional doctors at South Shore Hospital where I had my first mastectomy. He was in the surgery room every step of the way. Over the last eight years I have been seeing Dr. Wahi and my pain is under control. This man aside from being empathic is very, very knowledgeable in pain management. This man saved my life amongst other statistics that I had only a few years to live in 2003. Here I sit celebrating my 40th birthday in June 2010. Dr. Wahi has helped me so much, he makes living a little easier due to my disability and chronic pain due to everyday living. Dr. Wahi has helped me control my pain. During the winter time the pain gets more severe, the injections help me and I take one day at a time. Dr. Wahi sits with me, helps explain to me what I am feeling. I feel he does his very best that he can do for me and I am thankful to have him as my doctor. I have done physical therapy, injections and the pain medication helps me during the day. Dr. Wahi has helped me tremendously. Therapy is wonderful and the staff here are very friendly and helpful. I have been in pain for years and thanks to Dr. Wahi it is now bearable. Everyday life has become much better, especially being able to do things I wasn’t able to do before, such as bending over and picking things up. I’m more able to cope with people and do my work. Construction work is hard. My medication helps me function as far as lifting heavier objects, especially flooring. I’m able to work much better and at a faster pace. I’m not as slow as I used to be. I’m able to get up and do my chores at home as well. I’m thankful for being able to get back to working and doing things I wasn’t able to do before. Lifting, bending, etc.. and coping with people on an everyday level much much better. I believe since I’ve been coming here things are a whole lot better. He has helped the pain and anxiety. Physical therapy and injections has helped me and I enjoy coming here more than any other doctor. The treatment from Midwest Pain Center is very good. It helps me with my legs and back pain. I will give Midwest Pain Center 90%. I will tell other people to come here for treatment anytime. Dr. Wahi has helped me so much with my therapy. I have lower back pain frequently and coming here to see Dr. Wahi helps me maintain a little pain free. I appreciate all the time and work he has put into helping me out I hope to continue the same relationship we’ve been having. Dr Wahi is the best doctor I have seen with regards to dealing with pain and anything else. I can’t express how much he has helped me. He is truly a wonderful doctor and a wonderful person. I will recommend him to anyone in need of help for pain. So glad I found him. His staff is also excellent, kind and courteous, make you feel welcome. Dr. Wahi and staff have helped me tremendously. Whether injection or therapy both have been very beneficial in controlling my back pain. Cindy and Ana are also great to deal with on appointments and answering any questions I might ever have. I have been coming to Dr. Wahi for over a year. The staff is great and Dr. Wahi remains professional as well as friendly. I consider Dr. Wahi to be one of the best pain management doctors in the city. My name is Danny Joe Collins and the service that I receive from this pain center is very good. Don’t’ know what I would do without it. The facility is clean and the doctor is prompt and available to answer any questions that I may have. On a scale of 1-10, I give him a 10. Dr. Wahi is a good doctor, he treats my back very well and he eases the pain that I have in my back and the therapy is helping very well. Dr. Wahi is an excellent doctor. He takes the time to explain what’s wrong and what is needed to help my pain. Over the years he has helped me getting injections with minimal pains and he never hurts me more that I should. Best doctor I ever had in my 44 years. Dr. Wahi is a great doctor. He helps relieve pain at all my points of injury. He is a very kind person. The doctor does an excellent job. Dr. Wahi is a caring doctor, takes his time to answer all questions and has always the professional knowledge to solve all problems. Dr. Wahi has wisdom to solve all pain related problems. Dr. Wahi has wisdom and knowledge in making me a stronger person. Dr. Wahi is the best ever. Thank you for all your help. Coming here to the clinic has helped me ease my pain. The help from this clinic is very good. I’ve been coming here for years and had fast and effective service. Dr. Wahi has taken good care of me and has been very professional. The doctor has helped me so much with my pain in my back and knee. The doctor is very good making me feel welcome, the doctor is funny with his jokes. He is a very great doctor. I do what he tells me to do. I wish they had more doctors like him. When I first came to Dr. Wahi I could barely walk. I was in severe pain and did not know what to do. Thank goodness for his expertise in helping me to manage my excruciating pain. I’m still in pain on a daily basis but I can now walk with less pain than before I was referred to him. He seems to be a great doctor and he is managing my pain. For the last 4 years I’ve been a patient at Midwest Physician Pain Center and although I travel a great distance for my treatments, they are worth the trip. My injections are not as painful as I’ve received at some other hospitals and/or clinics. The staff is pleasant and most times I’m in and out in under an hour. The most caring doctor i ever met. There is passion in his desire to keep the patients off getting addicted to the pain killers and cure them with his injections and physical therapy. Dr. Wahi acts as a doctor and human being who listens to my personal problems as well and of course pain problems. I have been coming to pain center for a little over a year now with back pain. Dr. Wahi has helped me with my pain and staff at both locations are great. Always no problem getting appointments and always very friendly. I’m very impressed with the way they handle themselves and run the clinic, it is very well done. And I am always comfortable because the atmosphere is so relaxing, I always enjoy going there, not like other doctors visits. I like coming here because I’m never waiting, the appointments are always prompt. The pain clinic speaks for itself, always-relaxed atmosphere. The office manager Judy and Dr. Wahi are very very professional and very very nice. Wouldn’t go anywhere else. Thanks so much. Very happy with the results with my pain management. Dr Wahi and Judy are lovely! Very helpful with any questions. I have been coming here for years wouldn’t change them for anything. I have been a patient of Dr Ranjit Wahi since 2006. In the last 10 years, he has always maintained a professional office. It’s clean, peaceful, friendly, and compassionate. When I first started coming in 2006 I was overweight and many times the pain was so severe I was able to go to the doctor’s office and receive injections to straighten my back put instead of going to the hospital. He has a workout area, a sauna, and therapy. He encouraged me to get into physical shape and lose the weight and strengthen my core. I can always depend on his staff and the dr. To be on time and be there for me. I also suffer from anxiety and to have this consistent, caring doctor, has eased these attacks as they started after my 1st back surgery in 1994. My medicine has always been accurate and on-time as well. Thank you! I’ve been a patient of Dr Wahi’s for approximately 10 years. I have been very satisfied with his practice and enjoy his professionalism. His staff goes above and beyond their duties to make us feel special. Would not know what to do without Judy. Love them all. Dr. Wahi’s pain management center has done wonders for my severe spinal conditions(lumbar, cervical & thoracic).patients are seen at their scheduled times-literally no waiting. The staff is extremely professional and courtesy and extremely helpful on all aspects. Dr. Wahi has been able to allow me to function where other doctors Have not. He truly cares about his patients. Judy has been so helpful and has gone the extra mile navigating the Medicare system on my behalf. I would highly recommend this office to others who have debilitating pain and are in need of professional help that actually helps. I have been coming to see Dr Wahi and his staff for many years now. It is always a very laid back comfortable visit. It’s a small office so they take the time to know you. I have recommended many friends and will continue to do so. Dr. Wahi and Judy are great. The service i receive is great. They listen to me when regarding any problems I have when it comes to my pain. Don ’t Live in Pain! 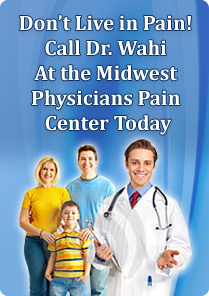 Call Dr. Wahi at the Midwest Physicians Pain Center Today.